This article recommends several good Python IDE (integrated development environment), and PyCharm is recommended. Of course, you can choose the Python IDE that suits you according to your own preferences. 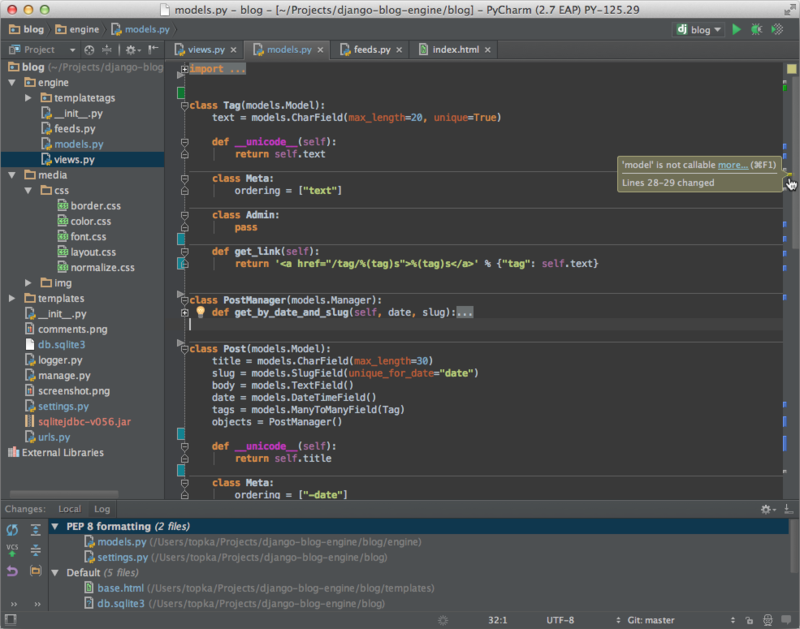 PyCharm is a Python IDE built by JetBrains. PyCharm has general Python IDE features such as debugging, syntax highlighting, project management, code jumping, smart tips, auto-completion, unit testing, version control, and more. In addition, PyCharm also provides some great features for Django development, while supporting Google App Engine, and even more cool, PyCharm supports IronPython. Sublime Text has a beautiful user interface and powerful features such as code thumbnails, Python plugins, code snippets, and more. You can also customize key bindings, menus, and toolbars. Sublime Text's main features include: spell checking, bookmarks, full Python API, Goto functionality, instant project switching, multiple selections, multiple windows, and more. Sublime Text is a cross-platform editor that supports Windows, Linux, Mac OS X and other operating systems. Eclipse can be found on its official website Eclipse.org and Download, usually we can choose the Eclipse version that suits you, such as Eclipse Classic. After the download is complete, extract it to the directory you want to install. Of course, before executing Eclipse, you must confirm that the Java runtime environment is installed, that is, you must install JRE or JDK, you can go to (http://www.java.com/en/download/manual.jsp) Find the JRE download and install. After running Eclipse, select help-->Install new Software, as shown below. Click Add to add the pydev installation address: http: //pydev.org/updates/, as shown below. Click "ok" when you are done, then click "+" of PyDev to expand the PyDev node. Wait a short time for it to get the PyDev related kit from the Internet. When it is finished, you will have more PyDev related kits. In the child nodes, check them and press next to install them. As shown below. After the installation is complete, you also need to set up PyDev and select Window -> Preferences to set PyDev. Set the path to Python and select New from Pydev's Interpreter - Python page. A window will pop up for you to choose the location where Python will be installed, and choose where you want to install Python. After completion, PyDev is set up and ready to use. A new window will pop up, fill in the Project Name, and the project save address, then click next to complete the project creation. Select the file storage location and Moudle Name in the pop-up window. Note that Name does not need to add .py, it will automatically help us to add. Then click Finish to complete the creation. Enter the code for "hello world". After the program is written, we can start executing the program and find the executed button on the toolbar above. A window will pop up that lets you choose how to execute. Usually we choose Python Run and start executing the program.